Welcome to the HYSTG Clan's Site!!! We are all in this together – and we are glad you are visiting our site. This is our online meeting place, where we organize our activities, share ideas, and publicize our mission. "I'm leaving wattpad. I'm not going to delete my wattpad account, I'm just going to leave it permanently. Goodbye wattpaders! :)"
1. Respect the founder, the co-founders and most especially respect Miss Denny. 3. Bawal ang spam and flood. Ang matigas ang ulo, papatayin ni Mel (founder). 5. You should have at least read 5 stories of Miss Denny para hindi ka ma-OP. 6. Post your comments and suggestions para mas lalo pang mapaganda ni Jupiter ang site na ito. 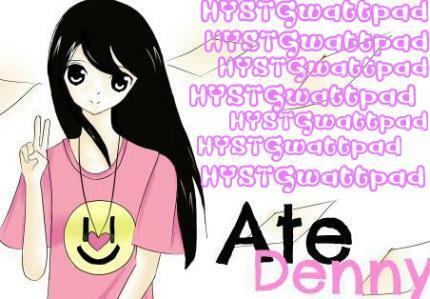 All non-fans and fans of the prominent wattpad writer, HaveYouSeenThisGirl or Miss Denny, are invited to join. Socialize with the members of the clan! ALL RIGHTS RESERVED. No part of this site may be reproduced or transmitted in any form or by any means, electronic or mechanical, including photocopying, recording, or by any information storage and retrieval system, without the consent of the site creator, except where permitted by law. DISCLAIMER: The creator of this page do not own any of the photos & gifs used in this page unless stated.